However, some more important similarities include the same use of irrational perspective, meaning that in both paintings foreground and background seem to exist on the same plane. Also in both paintings the table top is not represented in perfect perspective but instead it is at a steep slant, giving the impression that the fruits on the table could roll off at any moment. 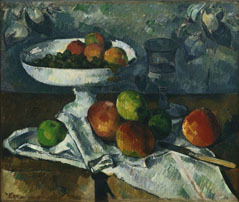 Cézanne often liked to use unnaturally round fruits in his still lives, which is important to note when considering his recognizable use of shapes (“Cézanne’s world of influence,” 2012). 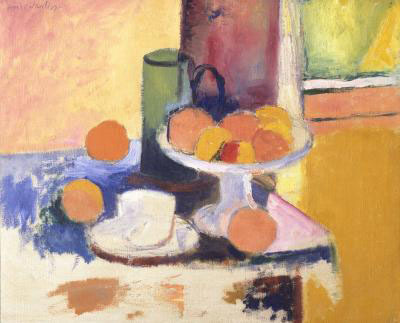 This is another quality that Matisse picked up on in his still life in the way his oranges are represented in perfect circles (Bois, 2009, 106). Lastly, Cézanne’s famous patchy application of paint exists in areas of Matisse’s canvas, although Matisse used much more broad areas of color that have much less variation than Cézanne’s work (112). The correlation between Cezanne’s work and Matisse’s early work is easily recognizable, but traces of Cézanne can still be recognized even in Matisse’s late career. 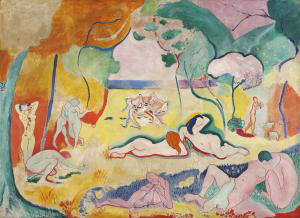 In Joy of Life, (figure 3) Matisse aimed to separate himself from his status of apprentice (113). At first glance, this painting seems to be completely unique, but Cézanne’s imprint remains. 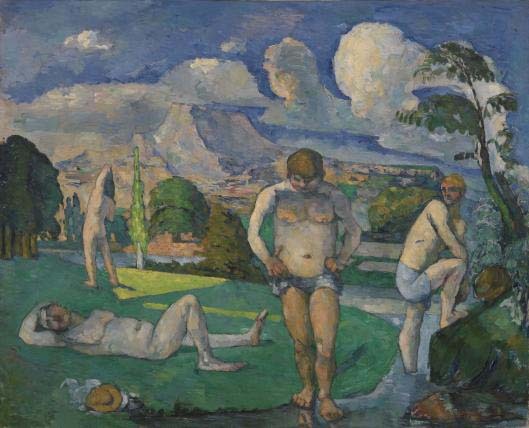 The figures in Joy of Life are indifferent to each other and exist of the same plane without any reference to rational perspective, which alludes to Cézanne’s Bathers at Rest. What is also similar about Joy of Life to Cézanne’s work is the reincarnation of “the classics” in a modern context.